It was a disaster that all but spelled the end of pleasure cruising on the Great Lakes. Four years after her sister ship, SS Hamonic, burned while berthed in Point Edward, SS Noronic was struck by a calamitous fire in Toronto Harbour. Launched in June of 1913 in Port Arthur (today’s Thunder Bay), the five-deck Noronic was the flagship of the Northern Navigation division of the Canadian Steamship Lines. On Sept. 14 of that year she sailed from Detroit for a seven-day cruise to Prescott and the Thousand Islands, picking up more passengers in Cleveland. After the cruise, she was scheduled to return to her winter berth in Sarnia. When she docked at Toronto’s Pier 9 on the night of Sept. 16 there were 524 passengers on board, all but 20 of them American. The crew of 171 were all Canadians – including a number from Sarnia. At 2:30 a.m. the following morning as most of the passengers slept wisps of smoke began spilling from a linen closet on C deck. When the locked closet was opened, fire exploded into the hallway and roared through the ship, fuelled by its polished wooden panelling. The alarm sounded and a call went out to the Toronto Fire Department. The first to leave the burning vessel was the wife of wheelsman Evert Pepper, of Sarnia. Familiar with its layout, she threw a coat over her pajamas and headed for a gangway at E deck – the only way out of the spreading conflagration. Passengers awoke to screaming and sirens and raced to escape the horrific scene as the ship around them went up in flames. The heat was so intense water shot from fire department hoses vaporized before it could reach the ship. Though many escaped, 119 passengers did not. Wheelsman Pepper was the last of the crew to depart the Noronic, not Captain William Taylor. Shockingly, only 15 of the crew were aboard when the flames erupted. 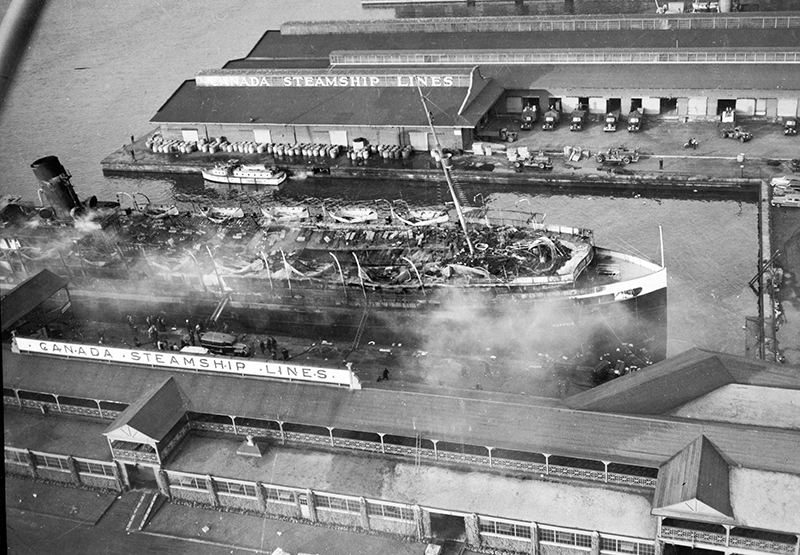 To this day, the burning of the SS Noronic at Toronto’s Pier 9 remains the worst fire for loss of life in Toronto history. Harry Brain had narrowly escaped a burning home in Sarnia as a child and the experience left him forever terrified of fire. So it was the 22-year-old’s misfortune to be a bar porter on the SS Noronic the morning of Sept. 17, 1949. At 2:30 a.m. he woke to the sound of screaming women and pounding feet on the deck above. Brain, who lived at 312 Cobden St., knew instinctively the roaring he heard was an out-of-control fire. Hurrying into his clothes he peered into the corridor of C Deck. Billowing smoke left him feeling weak and listless with dread. He saw Brain stumbling along the corridor and followed him down a companionway to the abandoned engine room. As they moved into the freight deck, tongues of flame licked the ceiling and smoke twisted around their heads. Brain tripped over an abandoned fire extinguisher and fell to the deck. Brown helped him up, and led them both down to a gangway and off the doomed ship. 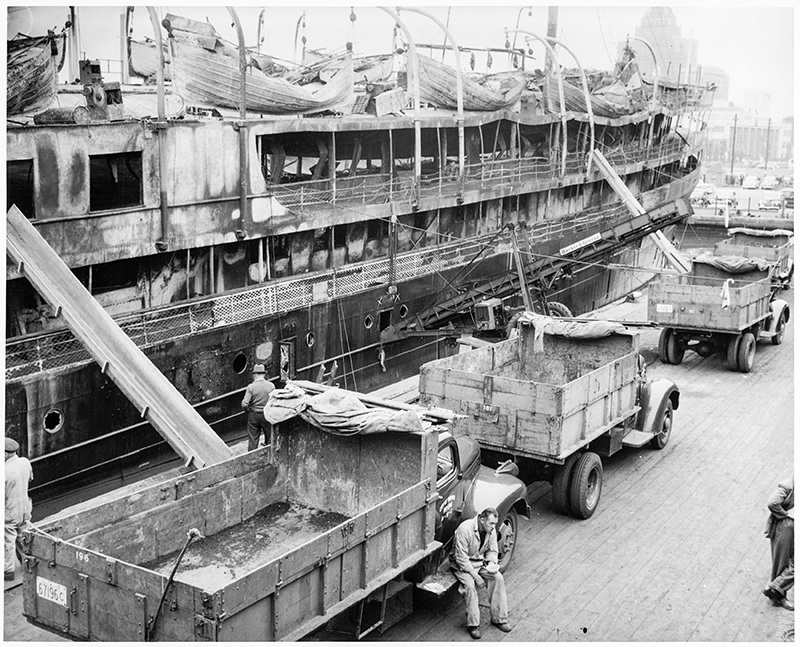 Berthed alongside was the SS Cayuga. There, on its deck, they found many other survivors – some praying, some weeping, others staring silently into the inferno.